For decades, medical researchers have sought new methods to diagnose how different types of cells and systems in the body are functioning. Now scientists have adapted an emerging biomedical technique to study the vast body of the ocean. In a study published Sept. 5 in the journal Science, a research team led by the Woods Hole Oceanographic Institution (WHOI) demonstrated that they can identify and measure proteins in the ocean, revealing how singled-celled marine organisms and ocean ecosystems are operating. The emerging biomedical technique of measuring proteins—a field called proteomics—builds upon the more familiar field of genomics, which has allowed scientists to detect and identify genes in cells. The new study is an initial demonstration that proteomic techniques can be applied to marine environments not only to identify the presence of proteins, but for the first time, to precisely count their numbers. 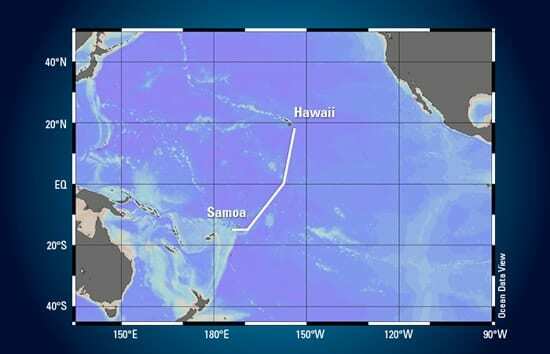 For their study, funded by the Gordon and Betty Moore Foundation and the National Science Foundation, the scientists collected water samples during a research cruise in October 2011 along a 2,500-mile stretch in the Pacific Ocean, from Hawaii to Samoa. The transect cut across regions with widely different concentrations of nutrients, from areas rich in iron to the north to areas near the equator that are rich in phosphorus and nitrogen but devoid of iron. Back in the lab, the scientists analyzed the samples, focusing on proteins produced by one of the ocean’s most abundant microbes, Prochlorococcus. They used mass spectrometers at WHOI to separate out individual proteins in the samples, identifying them by their peptide sequences. In subsequent steps, the scientists demonstrated for the first time that they could precisely measure the amounts of individual proteins from individual species at various locations in the ocean. The results painted a picture of what factors were controlling microbial photosynthesis and growth and how the microbes were responding to different conditions over a large geographic region of the ocean. For example, in the regions where nitrogen was limited, the scientists found high levels of a protein that transports urea, a form of nitrogen, which the microbes used to improve their ability to obtain the essential nutrient. Similarly, in areas where iron was deficient, they found an abundance of proteins that help grab and transport scarce iron. “The microbes have biochemical systems that are ready to turn on to deal with low-nutrient situations,” Saito said. In areas in between, where the microbes were starved for both nutrients simultaneously, proteins detected by the scientists indicated which biochemical machinery the microbes used to most efficiently negotiate multiple environmental stresses. The protein measurements enabled scientists to map when, where, and how ecosystem changes occurred over broad areas of the ocean. This study demonstrates how these targeted proteomic methods can provide new insights into how marine microbes respond to scarcity of nutrients in the oceans. By deploying these new diagnostic capabilities across the oceans and into the future, these methods could be used to understand how marine microbes – who form the base of marine food webs and are critical to regulating ocean chemistry – respond to the multitude of changes now occurring in the oceans. Along with Saito, the research team included Matthew McIlvin, Dawn Moran, Tyler Goepfert, and Carl Lamborg at WHOI, Giacomo DiTullio at the College of Charleston in South Carolina, and Anton Post at the Marine Biological Laboratory in Woods Hole. About the Gordon and Betty Moore Foundation – The Gordon and Betty Moore Foundation believes in bold ideas that create enduring impact in the areas of science, environmental conservation and patient care. Intel co-founder Gordon and his wife Betty established the foundation to create positive change around the world and at home in the San Francisco Bay Area. Science looks for opportunities to transform—or even create—entire fields by investing in early-stage research, emerging fields and top research scientists. Our environmental conservation efforts promote sustainability, protect critical ecological systems and align conservation needs with human development. Patient care focuses on eliminating preventable harms and unnecessary health care costs through meaningful engagement of patients and their families in a redesigned, supportive health care system. Visit us at Moore.org or follow @MooreScientific. 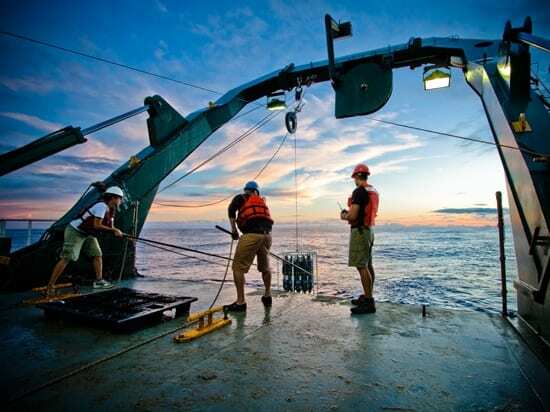 The scientists used a CTD (conductivity, temperature, depth) rosette to collect water samples during a research cruise in October 2011 along a 2,500-mile stretch in the Pacific Ocean, from Hawaii to Samoa. 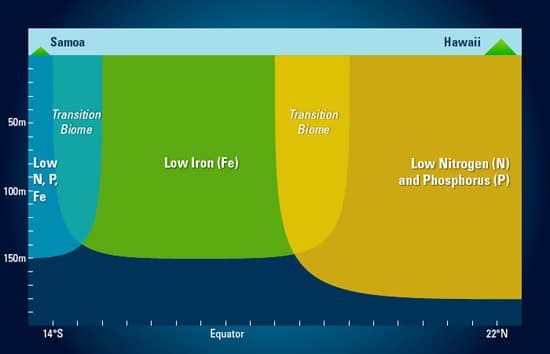 The transect cut across regions with widely different concentrations of nutrients, from areas rich in iron to the north to areas near the equator that are rich in phosphorus and nitrogen but devoid of iron. In the lab, Mak Saito and Research Associate Matthew McIlvin use mass spectrometers to separate out individual proteins in the samples, identifying them by their peptide sequences. In subsequent steps, the scientists demonstrated for the first time that they could precisely measure the amounts of individual proteins from individual species at various locations in the ocean.